Perched high on a bookshelf, in a rarely disturbed corner of my study, sits a memento that I prize perhaps more highly than any other in my life. 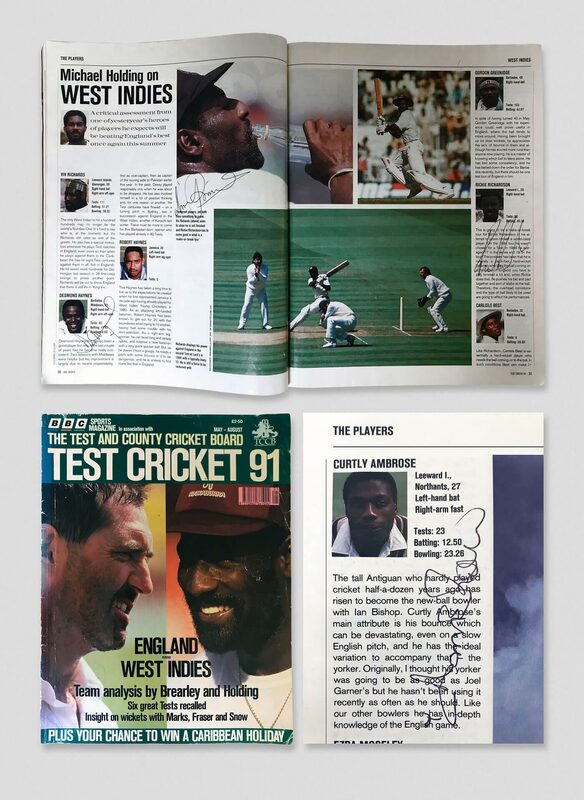 It is the official Test and County Cricket Board magazine that was published to accompany the 1991 West Indies tour of England - a document that, as a 13-year-old, I scoured on a near-daily basis through one of the defining summers of my sporting life. Then, as if to consecrate it, I brought it to The Oval for the fourth day of England's series-squaring victory in the fifth and final Test, to hoover up the autographs of the men who had cemented my adoration of the game. To this day, I can recite passages of prose that lay within - penned for the most part by men who would go on to become my press-box colleagues. There was Peter Hayter's appraisal of England's disastrous Ashes campaign of the previous winter ("it was plain as the nose on your face that the new England cricket supremo should be one of the following: Geoffrey Boycott, Brian Clough, Kenny Dalglish, Margaret Thatcher, Screaming Lord Sutch, Ian Botham, Mick Jagger, Spike Milligan or Gazza") and Scyld Berry's portrait of the debutant batsman who seemed destined to be the saviour of English cricket ("Hick will make runs against West Indies this summer, though not in the quantities which some are predicting"). Plus there was the assertion, in the West Indies pen pics on page 91, that "if there is a Test all-rounder of the future, it has to be Hamesh Anthony"… well, I remember him, even if you don't. But, with the diligence of a cricket nerd, I made it my business to harvest Hamish Anthony's scrawl nonetheless - as well as those of a raft of the mightiest men to have prowled The Oval's turf. 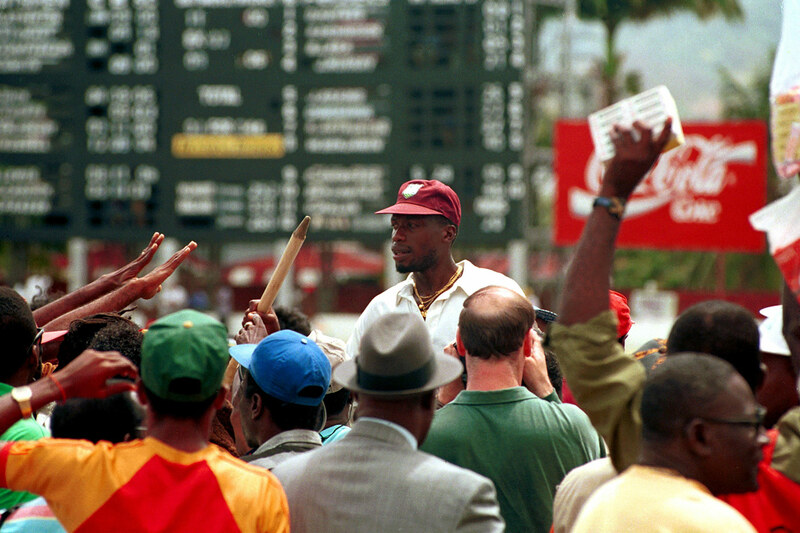 Viv Richards, whose final Test innings I had just been privileged to witness, was imperious and magnanimous in equal measure, even as his side were facing up to (near) inevitable defeat. 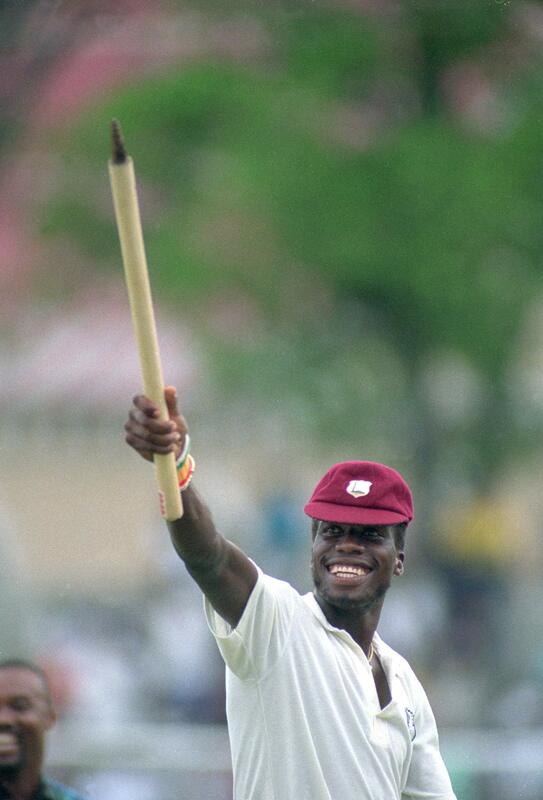 The late, great Malcolm Marshall was another to acquiesce with a grin. Richie Richardson and Desmond Haynes were collared on the concourse behind the pavilion, Patrick Patterson by its entrance. I ticked the star names off with alacrity. Then, with time running out and the team bus set to depart, I spotted my most coveted quarry. I'm not entirely sure how or when Curtly Ambrose became so embedded in my conscience. Why he became so embedded, of course, is rather more obvious. There he was, this magnificent specimen of towering, glowering malevolence, the personification of the cloud-scraping West Indian fast bowler, and apparent proof of the eternal conveyor belt of talent that would surely repel all challengers for evermore. I don't really remember the 1988 series in which Ambrose first made his mark - it exists as a series of faux memories, drawn as much from newspaper clippings as actual eyewitness recall. 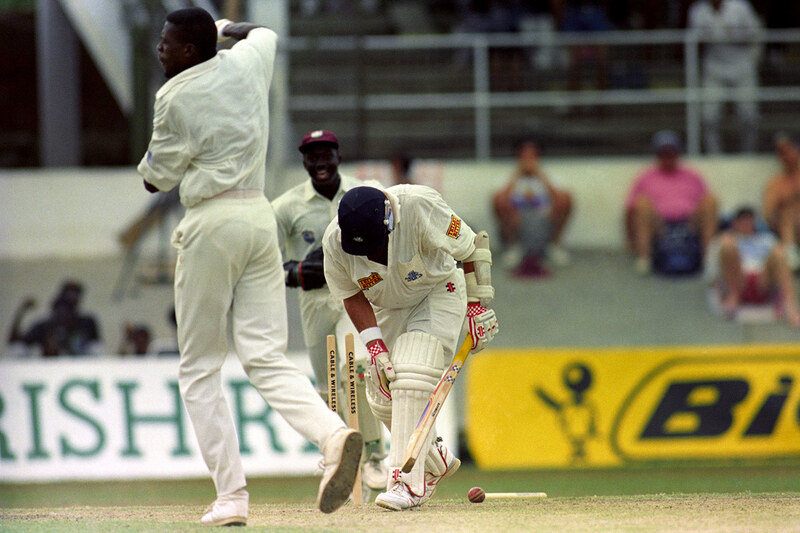 Likewise the incredible tour of the Caribbean of 1989-90, when England won against all odds in Jamaica, but were eventually reeled in, like an exhausted marlin. 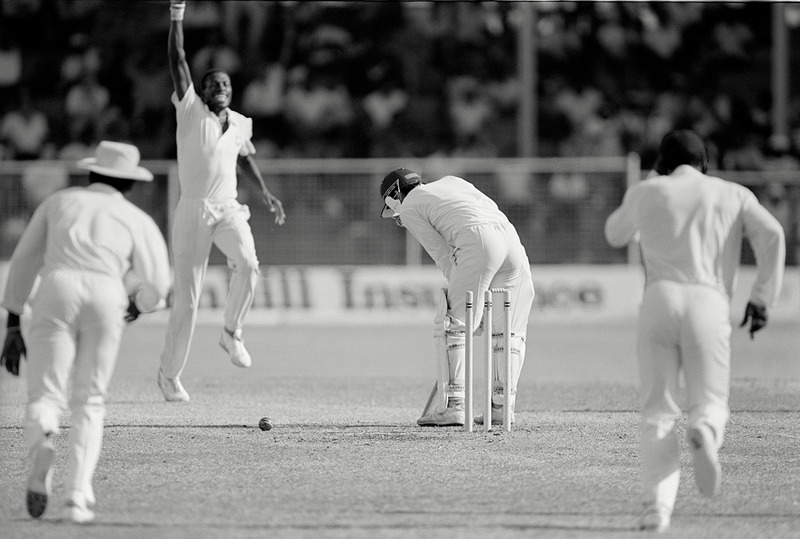 I read every description going of Curtly's 8 for 45 in Barbados - his shooter to Jack Russell and the trampling of the tail that followed it - but saw not a single delivery in those formative days of Sky TV's coverage, so my mind's eye was allowed to run riot and turn a giant of a man into a titan. And now he here was. Standing by the steps of the bus, arms folded, lips pursed, eyes level but fixed on a point so far above my own head it might as well have been the pavilion roof. He was as forbidding as a sentinel, and, with West Indies' follow-on in full swing and a serious day of series-salvaging already on his mind, he was in no mood to entertain the advances of an irritant infant, barely half his height. "Curtly speak to no man!" Did he actually utter these immortal words at me? I think so, though equally they may have been paraphrased by David Williams, West Indies' diminutive reserve keeper, who became my improbable sidekick in the impasse that ensued. Curtly never signs autographs in the middle of a match, Williams explained to me while serving up his own - especially not when he is losing, he might have added. But neither was Ambrose walking away from me and my outstretched pen, so - for who knows what reason? Emboldened by Gooch's 154 at Headingley, perhaps? - I chose not to walk away either. His team-mates filed by, onto the bus - some with a chuckle at this curious stand-off, others with heads bowed and eyes only for the step off the pavement. But Ambrose would not budge, until Williams - amused, but probably getting bored - whipped the magazine out of my hands and proffered it to his team-mate, who signed with the sigh of a mid-spell fast bowler who'd been asked to move a little finer at deep backward square. There was still no eye contact as the newly minted signature arrived back in my hands - it had been granted as a favour to a team-mate, after all, rather than as a surrender to a pest. It felt like the beginnings of a bond nonetheless - one that drew me in deeper and deeper as the legend was clad around the man. Initially, his sheer physical presence made me assume he must be the quickest bowler ever to have walked the earth, and feats such as his stunning spell of 7 for 1 against Australia in Perth did little to dispel that notion. It took me a few years of observing his craft - or more pertinently, observing Mike Atherton struggling against his craft - to recognise exactly what it was that made him so special. Stature aside, there was never anything about his actual method that blew my mind - certainly not in the manner of Waqar Younis' reverse-swinging yorkers and Shane Warne's shape-shifting legbreaks, treats that would lie in store for the summers of '92 and '93. Rather, Ambrose's brilliance stemmed from the fear of the all too very well known - the snap of a mousetrap on a perfect rearing length, the fizz of a yorker descending like a comet from the skies, and all backed up by that blood-chilling stare and midget-eating grin. His moods, on the other hand... now they were a force of nature. All of his magnificent pistons - those pumping arms, those high-stepping knees, even the cocked-cobra preview of his wristbanded bowling hand - seemed to be powered exclusively by fury. To this timorous observer at least, the pursuit of victory against an Ambrose-powered West Indies required caution, deference and a surfeit of good manners. He was like a capricious military commander, liable to execute entire batting line-ups in retaliation for a perceived slight, be it an under-edged four to a pull off a good length, or just the faintest whiff of a threat to his team's hard-earned hegemony. In English minds at least, he never illustrated this trait better than in Port-of-Spain in the spring of 1994, when Atherton's men - 2-0 down in the series but finding some resolve at last - had seemingly made themselves favourites to snaffle the third Test. I learned of this improbable turn of events courtesy a stray shred of English-language newspaper on the S Bahn in Hamburg, where I had been spending a fortnight of the Easter holidays on a school exchange programme in Germany. This whisper of intel - no more than two column inches of sparsely clipped detail - confirmed that England had eked out a precious first-innings lead of 76, and built on that position throughout the third day with regular second-innings wickets. That evening I rushed to my long-wave radio to seek confirmation of England's glory via the BBC World Service. Beneath the crackle of static and the plummy intonations, I heard a scoreline so remote and otherworldly, I quite literally refused to believe my ears. "Sport now, and England's cricketers are on the brink of a heavy defeat in the third Test against West Indies in Trinidad, collapsing to 40 for 8 after an inspired spell of bowling from the fast bowler, Curtly Ambrose." The next sports bulletin was not due until after midnight. I was cut adrift with my thoughts for six agonising hours - left to sprechen GSCE Deutsch across the dinner table while mein hosts made polite and rudimentary conversation, unaware that my stammering responses, for once, had little to do with my feckless grasp of language, and everything to do with the grinning, hand-jiving ogre that was dancing around in my brain. Some weeks later, when I finally caught up with the highlights that my mother had (kindly?) remembered to record, the reality was more gruesome than I could have conceived. That first-ball inducker to Atherton; Mark Ramprakash's synapse-fried run-out; the post-traumatic glaze in the eyes of Graham Thorpe at his dismissal to the penultimate ball of the tumultuous fourth day. It remains the single greatest trauma of my sports-watching life. But with time and distance to distil the memories, Ambrose's magnificence transcends all other emotions from that match - his refusal to countenance the nagging doubts about West Indies' pre-eminence, and his pride in upholding, and in so many ways surpassing, the standards set by his illustrious forebears. Each of his wickets brought that familiar skywards drumroll of wrists, followed by an urgent high-clapping of his team-mates' upraised palms - a celebration now ubiquitous but at the time exclusive and exotic. The scenes in the stands were a Caribbean calvacade - leaping, honking, whistling rapture. Situation normal for the mightiest region in the game. How little we then knew! That England took until the summer of 2000 finally to expose the fault lines in West Indies' rapidly weakening team was a tribute to the last remaining Kings of the Caribbean - Brian Lara with the bat, and Ambrose and Courtney Walsh with the ball. The final curtain, for Ambrose at least, would fall at the same venue where it had all begun for me, at The Oval, when he and Walsh left the field arm in arm, beaten but unbowed at the end of a 3-1 England series win, their first against West Indies since 1968. Ambrose's last, and most poignant, stand had come three Tests earlier, in a seismic tussle at Lord's, which would ultimately determine the series. One-nil down in the series after another rout at Edgbaston, a gripping contest had come down to England's pursuit of 188 for victory. History records that England won by two wickets in scenes of umbrella-gnawing tension - and while Walsh's six wickets stand out in West Indies' scorebook, Ambrose's contribution was the most evocative contribution to a chase conducted through treacle. Twenty-two overs for 22 runs, a final reminder of the parsimony at the heart of his mighty methods, but a solitary wicket hinting at a fractional easing of malevolence in his delivery. From first ball to last of the 69.5 that England required to inch across the line, his very presence was a reminder to take nothing whatsoever for granted, just as his absence thereafter confirmed that the end of the dynasty had been reached. And, in a curious postscript to our original meeting by the bus, it just so happened that it was my turn to do Curtly a favour during the Test match at Edgbaston this summer. Emerging from the lift on the top deck of the media centre, armed with no accreditation other than his genius, he was barred entry to the press box by a steward who, to be fair, was only doing his job. "It's okay, he's with me," I lied, while ushering him swiftly through the doors. It wasn't strictly untrue.